Make your Wrangler JK stand out from the crowd while adding some additional lighting with the Mesh LED Grille from DV8 Offroad. This grille is made of tough ABS plastic and installation is simple enough to do on your own. The flat black color while make any color JK look amazing and adding a 20" light bar (not included) will light up the trails at night for you to see. The mesh grille section allows for proper ventilation just like your factory grille. ABS Plastic: Made to be thicker and more durable then your factory grille giving you a quality replacement that looks and functions great. 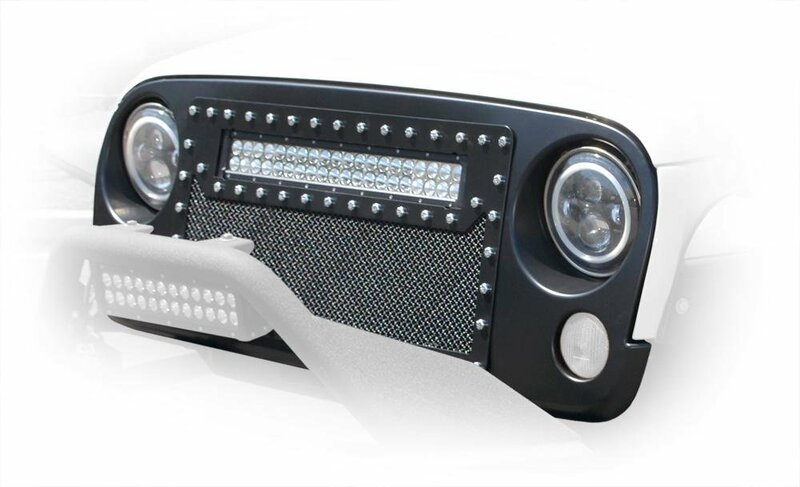 Light Bar Cutout: Comes with a light bar cut out for you to fit a 20" LED light bar so you can turn night into day when going off-roading at night time. Installation: All hardware that is needed is provided making installation a snap along with seals for under the hood.